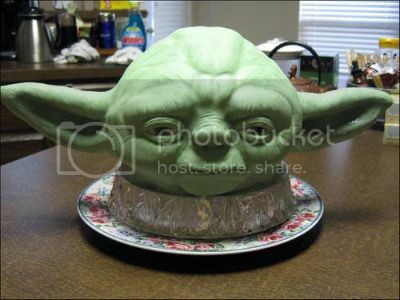 Instructables user tchitwood created this absolutely uncanny likeness of Yoda out of red velvet cake, Rice Krispie treats (for the ears) and fondant. Oh, and by the by, she accomplished this on her first attempt at making a sculpted cake. Which totally reminds me of the time I created cold fusion on my first try, using nothing but half-empty aerosol cans of whipped cream and a magnifying glass. Yeah. I know my humble feat of scientific marvel completely diminishes tchitwood’s efforts and everything, but please… see if you pull yourself from your completely-merited awe of me for just long enough to appreciate her work.